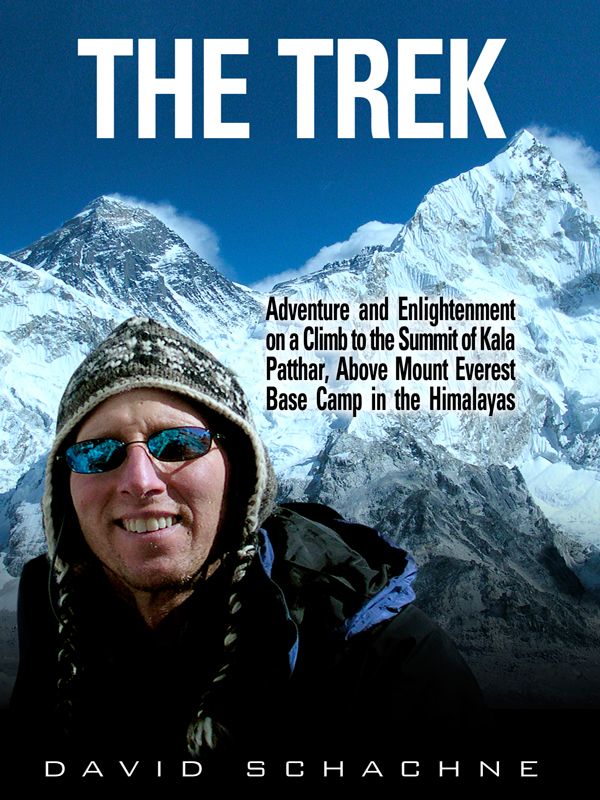 The Trek: Adventure and Enlightenment on a Climb to the Summit of Kala Patthar, Above Mount Everest Base Camp, tells the story of David Schachne’s adventure in November, 2004, when he went on a trek, attempting to summit Kala Patthar, a mountain which towers above Mount Everest Base Camp (17,598 feet) in the Himalayas. At 18,192 feet above sea level, the summit of Kala Patthar offers successful climbers one of the most amazing views of Mount Everest (29,035 feet) without having to put your life at risk by entering the Khumbu Icefall toward Everest’s South Col route, or by climbing Mount Lhotse (27,940 feet) or Mount Nuptse (25,791 feet), the two high peaks closest to Everest. Born and raised in Brooklyn, NY, Schachne loved visiting the great outdoors as a teenager, going camping and hiking in the Catskills and the Adirondacks. Throughout his early adult life, he had a burning desire to go trekking in the beautiful, magical and magnificent Himalayas. This wasn’t just due to his love of the mountains and trekking. He believed going there would somehow make his life more fulfilled. An avid hiker, Schachne certainly did not expect his trek to be a “walk in the park”, but he was ill-prepared for what was in store for him. Continuously dodging bull-dozing yaks and dzos to prevent from being gored was the least of his worries. Climbing for hours and hours each day while mentally and physically exhausted; confronting constant sub-freezing temperatures; dealing with illness, high altitude sickness, piercing headaches, wretched odors, utter filth, bacterial infections, dysentery and more, he endured two weeks of pure, nightmarish misery. In this riveting account of his gut-wrenching trek over fourteen mostly sleepless days and nights, while basically malnourished, Schachne takes you along on each and every step of his journey so you can witness both the “glory” of the Himalayas and the “gory”, chilling details of his daily despair. You’ll experience the ups and downs of the hills and valleys, along with the highs and lows of both his personal triumphs and chaotic travails. You’ll hear about the most spectacular scenery on the planet, along with the most horrific, unsanitary outhouses ever imaginable – as you venture out with him on the long and winding road, to the summit. He flies from Kathmandu in Nepal to the most dangerous airport in the world (Tenzing Hillary Airport), in a town called Lukla, at 9,000 feet above sea level, then hikes to Phadking and then Namche Bazaar, a virtual tourist town and flea market at 11,000 feet, then to the architecturally beautiful Thyangboche (Tengboche) Monastery and then on to Dingboche, Dzugla, Lobuche and Gorak Shep, before finally attempting the summit of Kala Patthar. For better and worse, you’ll feel like you were there – as if you were walking in his shoes. Schachne reveals what originally led him to fall in love with nature, why he was so determined to go to the Himalayas, and why he persevered despite the brutal bodily punishment he experienced. If you don’t ever plan on visiting the Himalayas, The Trek will take you there without leaving the comfort of your home. Even if you are not a climber, or even a day hiker, you will get a fascinating inside-view of a sport and a world you have never seen before and hear a story that will have you sitting on the edge of your seat. For the very few of you, however, who are even possibly considering going to visit the Himalayas, or thinking about trekking to Everest Base Camp or attempting to summit Kala Patthar, then this book is an absolute must-read. Join Schachne for the most entertaining adventure of your life, as he takes you along on this thrilling, harrowing and laugh and cry-out-loud journey. Are you ready to take a hike? You can purchase the book online from Smashwords in multiple eBook formats at http://www.smashwords.com/books/view/354615.